The candidates for 2016 are Hakainde Hichilema, Nevers Sekwila Mumba and Michael Chilufya Sata. There will be 63% voter turnout based on the average of the last 5 elections. There will be a 20% growth rate in registered voters from the last election (based on a 15 year trend that suggests the Law of Diminishing Returns is setting in since new voter registration is approaching saturation). There will be about 6.2 million registered voters and almost 4 million ballots cast. 5% of the votes shall go to the rest of the candidates except in Western Province. The distribution of registered voters in 2016 by province will be same as 2011. This is of course strictly not correct but I have to make an assumption to simplify the forecast without going into the complications of comparing the growth rates of registered voters by province. Moreover, I expect any deviations to be minor. It is unlikely there will be massive shifts in voting patterns of 20 percentage points in most provinces for reasons explained earlier (vote consolidation). 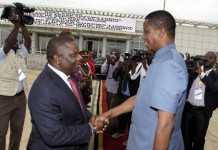 It is a curious fact that no president has ever hailed from the South-Eastern part of Zambia. Two were from the North, two from the East and one from the Center. There could be many plausible theories for this but I tend to believe that the answer lies in the distribution of registered voters in Zambia. The North-Eastern part of Zambia has the biggest share, followed by the Center and then South-West. A highly simplified basic calculation assumes Area A (North-East) is Northern, Luapula, Eastern and a third of Central province. Area B (South West) is North-Western, Western, Southern and a third of Central. Area C (Center) is Copperbelt, Lusaka and a third of Central. 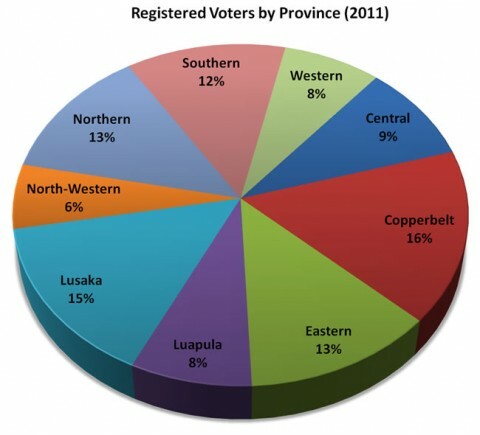 Registered voters are: Area A 36%, Area B 34% and Area C 29% based on the breakdown of the 2011 Voters Roll by province. 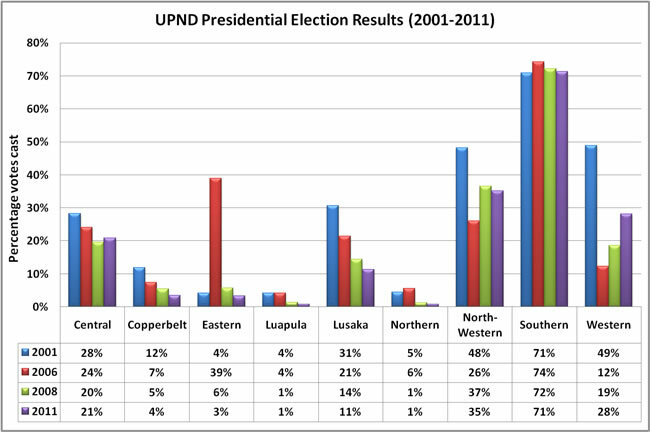 Based on results of the four elections in the ten years 2001-2011, Hakainde Hichilema will certainly handsomely win Southern province in 2016 but will remain a non-factor in Northern, Luapula, Eastern and Copperbelt (he got less than 5% in all these areas in 2011). I expect Hichilema to have a slight edge in Western over Mumba and for Sata to drop to 5% from 23%. 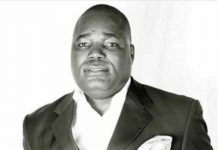 The voters in Western Province have been deeply disappointed by the failure of the PF government to fulfill its campaign promise of restoring the Barotseland Agreement within “ninety days” and there is no doubt they will severely punish Sata and the PF for this, notwithstanding the “development projects” PF is busy trying to push into Western Province. My forecast of MMD being overtaken by UPND is because it is likely that Mumba and Sata will be lumped together as Bembas who cannot be trusted by the Westerners. 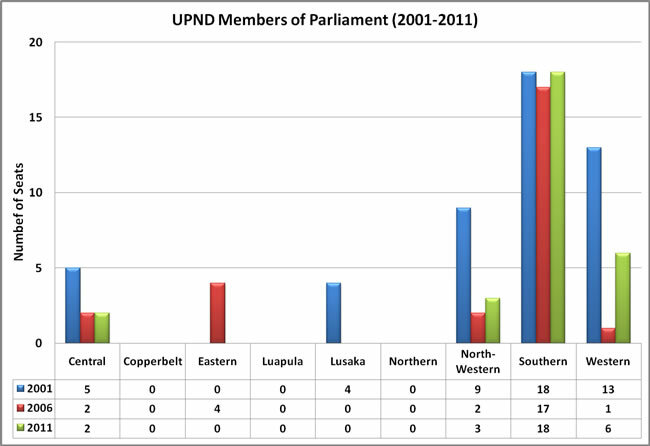 North-Western will give UPND a slight edge over MMD. Even though the gap in the last election was 15% in favour of MMD who had massive amounts of money, I think Hichilema will do much better with the two parties both being in opposition. I expect Sata to beat Mumba in the Copperbelt, Northern and Luapula by smaller margins but he shall drop significant points in Lusaka and Copperbelt. Central and Eastern are still MMD strongholds and I expect Mumba to win them easily. Estimated margin of error is ±5%, meaning that the MMD win is by no means assured. I had to take into account other factors in this forecast. MMD no longer has huge resources for campaigning which is why I expect them not to score as much as before in Western and North-Western where Mwanawasa won in 2006 with between 60 and 70 percent margins. 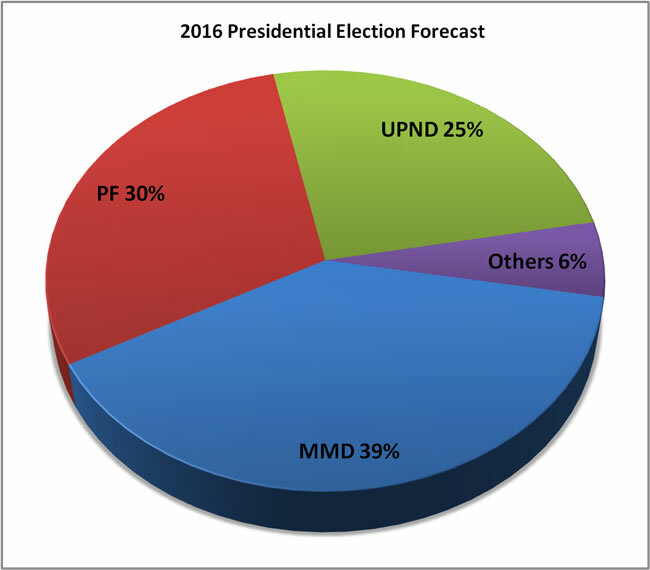 MMD will likely be at a disadvantage to UPND. The inevitable loss in votes for PF in Eastern province (as the M’kaika Constituency By-Election suggests) will advantage MMD since UPND is not a factor there (Hichilema got less than 5% in 2011). Any losses of votes by the PF mostly advantages MMD as their respective supporters are a closer fit. With Sata less popular, I expect Hichilema to pick up more votes overall up to 25% nationally. UPND seems to have very weak party structures (if any) in Area A which is partly why they do badly there, aside from the usual tribal voting that occurs in almost all provinces. 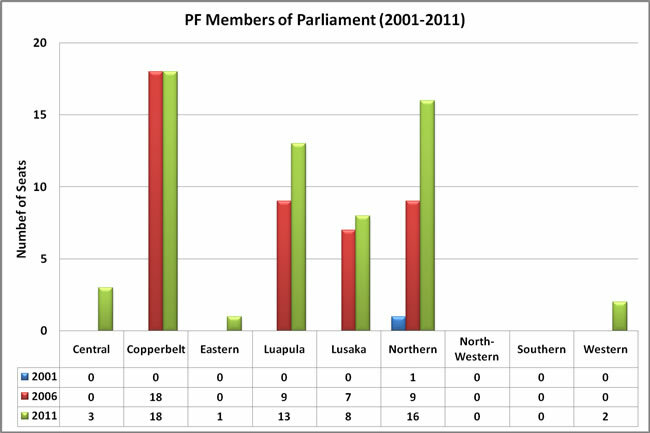 The results of upcoming By-Elections may potentially affect public opinion, more so if PF is seen to be losing. Voter turnout may be another significant factor although it is not straightforward to say which way it will go. Conventional wisdom says high voter turnout advantages the opposition and vice-versa. 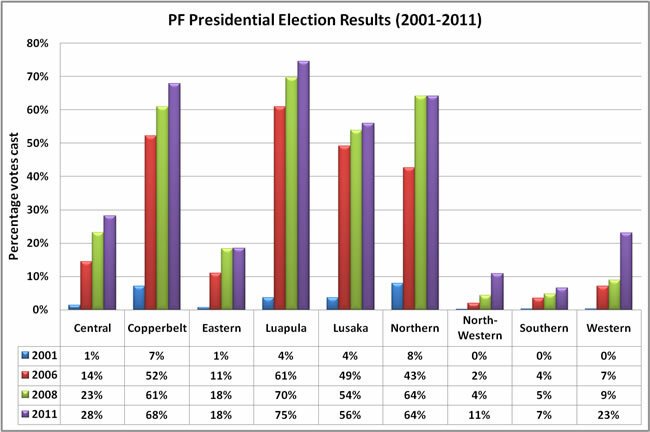 The 2001 elections had 68% turnout and Mazoka lost by only 2%. 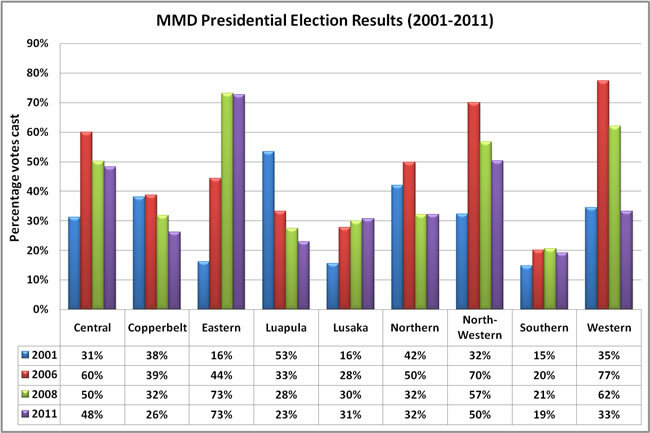 However, the 2006 elections had the highest voter turnout at 71% and Mwanawasa won easily by 14% over Sata. Sata beat Banda by only 6% with turnout at 54%. The 17% drop implies almost a fifth of the electorate felt the candidates were not inspiring. If even half of this number resurface in 2016, it may be a game changer. I think that in 2016, high voter turnout will work against the PF because of how bad their record has been just in the first two and a half years. There may be other “wild-card” factors that may slightly alter the results or otherwise flip everything upside down. If Michael Sata does not contest, it will significantly weaken PF and give Mumba a stronger win because none of the other PF big-wigs have his charisma or power base. The confusion and power struggle that would ensue in PF would certainly advantage the MMD and UPND. Another potential game-changer is a split in PF due to heightened internal wrangling. This would instantly spell the death of PF and I expect a good chunk of people that would leave PF to try to join MMD. Mumba pulling out due to a court conviction could send shockwaves as the MMD has not too many leaders of his calibre. 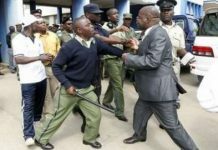 People like Felix Mutati or Kabinga Pande have little experience leading an opposition party through thick and thin, which is why Mumba is probably the best person to lead MMD right now. 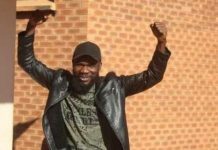 He was financially liquidated by former President Frederick Chiluba and he got fired as Vice-President by Mwanawasa, only to bounce back to the top of the MMD food chain. Against Sata, another MMD candidate would probably be less popular than Mumba but I would expect them to still win. Sata won by 183,100 votes (6 percentage points). In 2008, he lost to Banda by 2%. If Mumba and Sata were absent, I would expect UPND to increase its tally slightly but I would still expect MMD to win due to UPND’s weakness in Area A. Depending on which tribe the MMD candidate is, votes can swing wildly in unpredictable fashion. 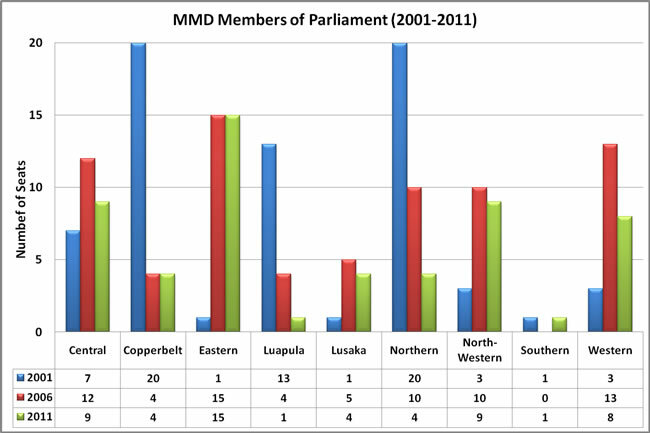 For example, if MMD got a Tonga president (extremely unlikely), it may advantage them in Area B but kill them in Area A. The results of a Lozi MMD president would have similar results. If businessmen currently sitting on the fence begin financing MMD, their win would be more emphatic. My forecast would certainly not be complete without the National Assembly. 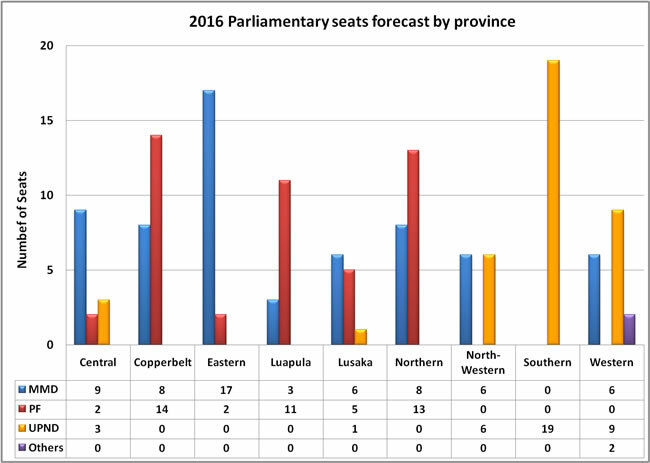 Parliamentary seats are far more difficult to forecast than presidential elections because you are dealing with 150 of them and the factors at play in each seat are wildly varied. 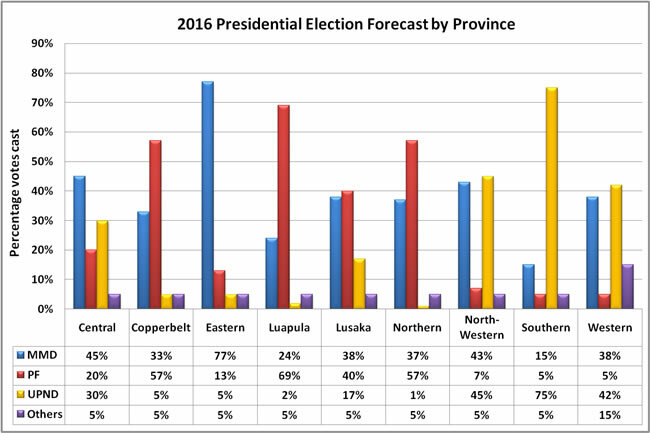 I did my best to study the numbers for each party by province as shown in the charts above and I came up with 2016 forecast numbers that reflect the trends from the last 3 elections and take into account new factors such as the PF losing popularity in Zambia. The margin of error is ±8%. Prima facie, MMD seems to be in pole position. One way they can lose is if Mumba fails to sell himself properly to Zambians. As it is, there is just too much material for the opposition to hit the ruling party with. The internal wrangling inside PF means they will be less focused on weakening the opposition who will now have more opportunity to fight back. This forecast is based on things as they stand now. It is likely to evolve as the relative strengths of the various factors at play begin to change. For example, if PF keep messing up, they will drop more points in their strongholds and hand MMD a landslide. If they begin correcting their mistakes, the election may end up a dead heat with both parties getting around 35%. If the smaller parties get organized, they could take a bigger bite from the pie and move to around 10%. 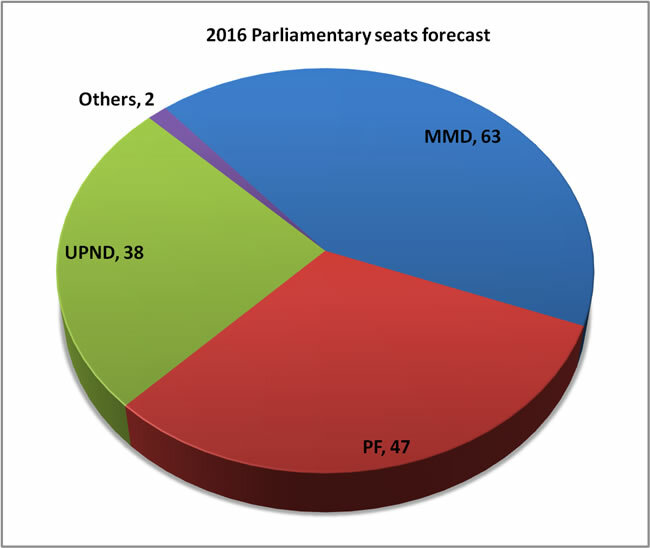 If UPND find a way of increasing their appeal in Lusaka and Copperbelt by say 50% in the next two years, it could impact the analysis. Finally, it should be noted that we may be entering unchartered territory. Since the creation of Zambia in 1964, we have never had a party get kicked out of power and bounce back. MMD will make history if they pull it off. Some people are of the view that perhaps it would be good overall for the country because MMD would be far more humble the second time around, knowing that Zambians can give them the boot if they mess up. Rupiah Banda’s arrogance when he was president was very annoying. As the Katuba Constituency By-Election last month demonstrated, not even the creators of the “Donchi Kubeba” slogan are immune to its effects. 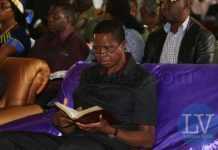 The standards of Zambian politics have been raised. 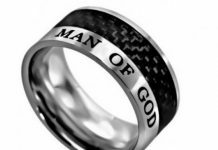 You can comment below the article or you can email me: michael at zambia dot codot zm. than a traditional wedding because of discount vacation packages that are available at many travel agencies. Budget Planner to keep track of all the expenses. be able to spend quality time together.